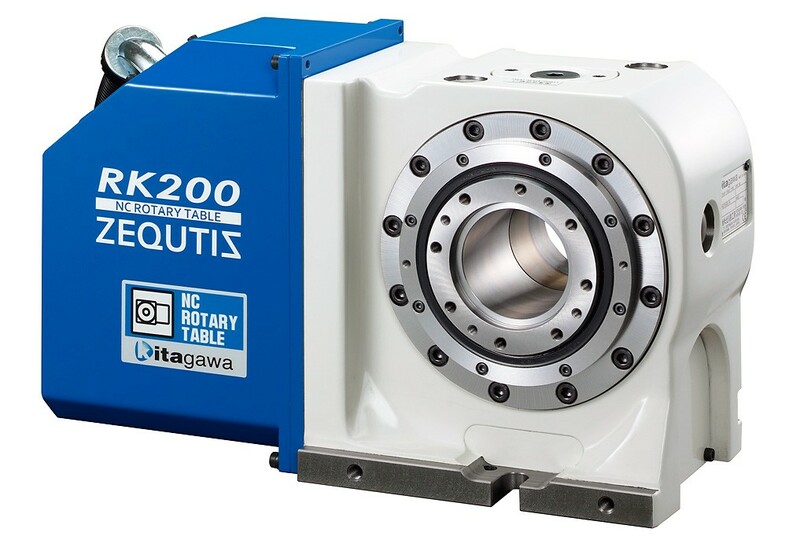 Kitagawa’s new RK200 model is an incredibly quick rotary table that is suitable for Aluminum work pieces of automotive, medical, electronics and optical parts where multifaceted machining or multi-holes drilling is required. Rather than utilising traditional gear sets, the RK200 is fitted with a free roller gear cam reducer. The removal of parameter adjustment that is required by direct drive rotary tables means that a shorter indexing time is achieved to 180°, with the RK200 able to index through 90° in just 0.31 seconds and 180° in just 0.46 seconds. The roller gear cam reducer also greatly reduces heat generation. This means that even under constant operation, accuracy of the RK200 will not deteriorate due to heat expansion. As roller gear cam reducer is long-term maintenance free, downtime is minimised, improving efficiency even further. The RK200 has a table diameter of 114mm with a centre height of 150mm. The through-hole diameter is 70mm, whilst the load capacity is 60kg.